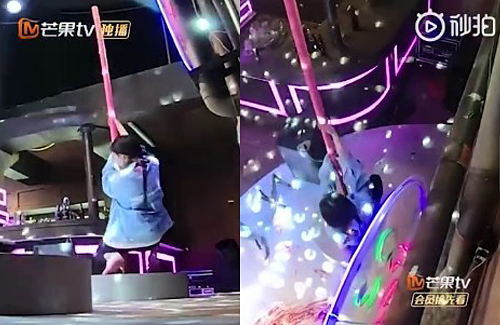 Yang Mi (楊冪) recently joined reality show Great Escape <密室大逃脫> and in a surprise move, she showed off her pole dancing skills. Yang Mi guest starred on Great Escape alongside her costar from Tiny Times <小時代> Evonne Hsieh (謝依霖). Deng Lun (鄧倫), Justin Wong (黃明昊), Wei Daxun (魏大勳), and Zhang Guowei (張國偉) were featured as well. The show focuses on a group of artistes trying to make an exit in some very difficult escape rooms. In one of the rooms, there was a pole-dancing setup, which left the stars confused as to how it related to their escape. Suddenly, the theme song of “Half a Life” <飛馳人生> started playing, which reminds one of Yin Zheng’s (尹正) pole dancing scenes in the drama. Listening to the music, Yang Mi’s fun personality began to show and took the lead in an impromptu pole dancing. Though she did it out of fun for only a few seconds, her fans were delighted by Yang Mi’s dance moves. This sequence captured over 2 million views and became a trending topic on social media.